Hello to all my amazing followers. 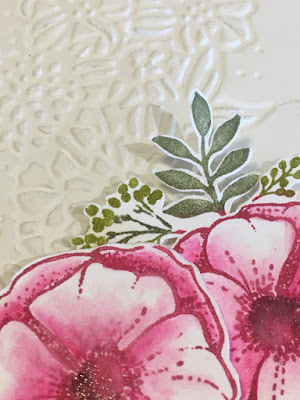 I started with this lovely embossing folder from the Petal Pair Textured embossing folders (OC p. 23) I have used the de-bossed side to make it easier to add some heat embossing on the background. You can see the gold embossed "spray". This is another stamp from the Amazing You set. 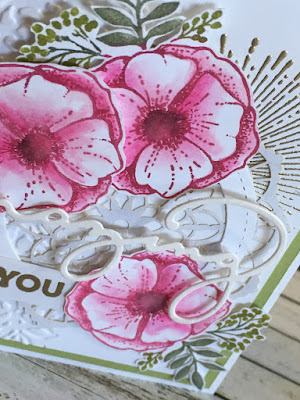 I stamped the flower 3 times using the "marker direct to rubber" method. That is where you colour the rubber image with Stampin' Write Markers. A great technique that allows you to print numerous colours at the one time. 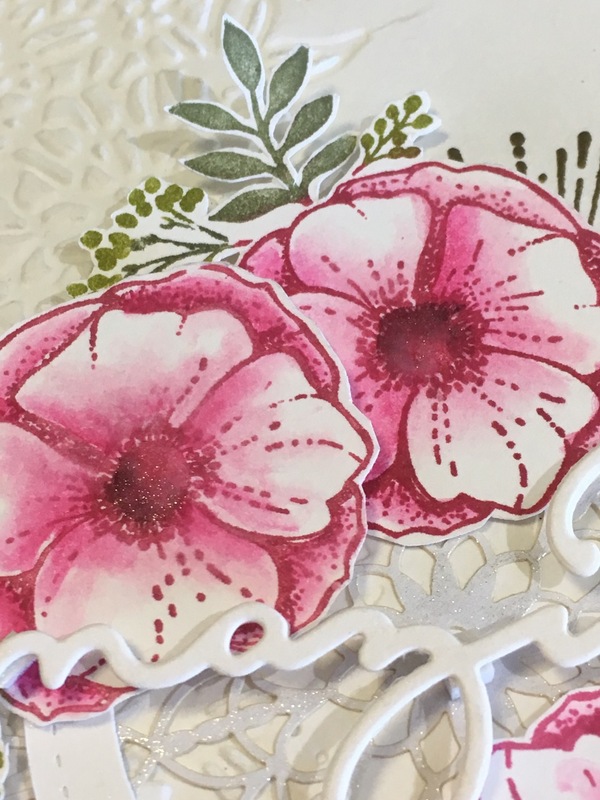 No need to rush with the colouring as a simple huff of your breath on the stamp will moisten the ink and you can stamp directly onto the card stock. It is best to use the brush end of the marker. I coloured the flowers with an Aqua Painter and ink from the top of the ink pad, using the same Rose Red colour. I find the soft effect to my liking. I also added a little Fresh Fig to the centres of the flowers. 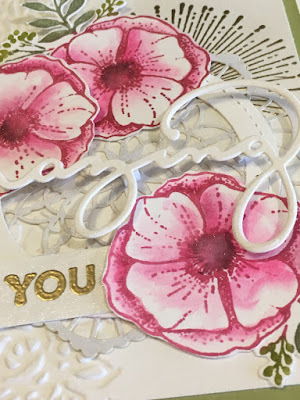 You can see the layers of doily, a hollow circle cut with the Stitched Circle Framelits, the flowers that have been fussy cut with Stampin' Up! 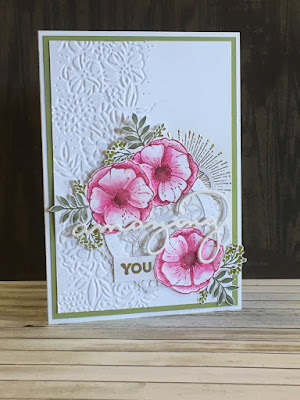 paper snips, and a die cut "amazing" from the Celebrate You Thinlits. The good news is these Thinlits will be available in the 2018 -19 Annual Catalogue, so if you missed out on them you just need to be a little patient. 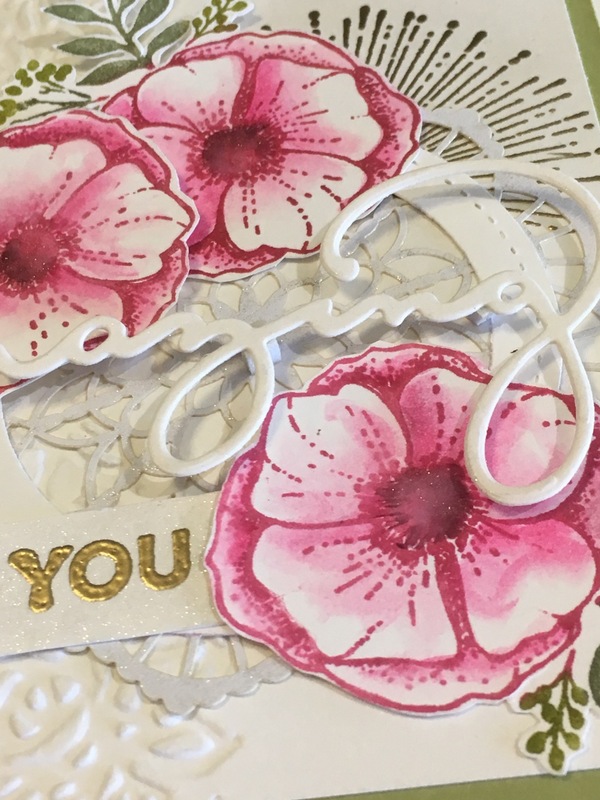 The small greeting "you" has been gold embossed then coloured with Clear Wink of Stella. I also coloured the doily and the "Amazing" with the Wink of Stella. I hope you like the card - it was lots of fun to make. If you would like to order any of the products I used, select the images below and it will take you directly to my on-line store.